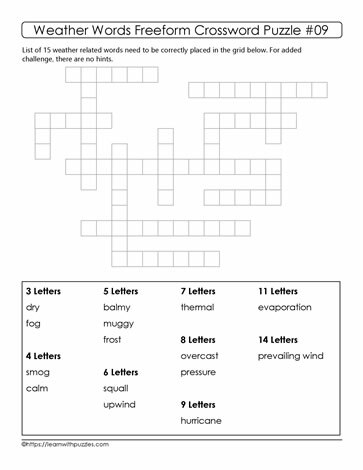 This freeform crossword weather word puzzle engages students' brains while helping to consolidate spelling, activate the visual-spatial area of the brain as they locate the blank squares needed to fill the squares. Puzzles support brain health, and this puzzle also introduces new vocabulary for some. Suitable for educators providing teaching of environmental science, weather and global warming.